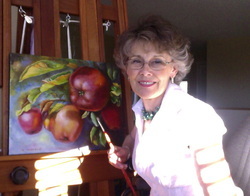 I began painting "living" flowers and fruit as my full time focus in 2011. It doesn't matter how long an artist paints, we continue to explore and learn as long as we hold a brush. And so we are forever art students. 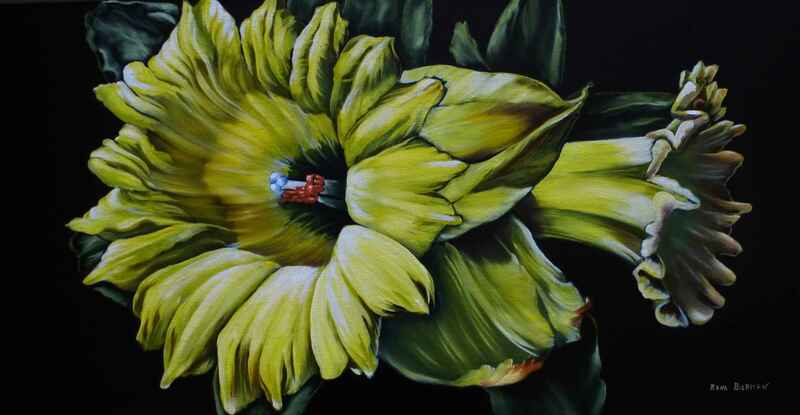 Rena distinguishes her floral and fruit paintings as “Living” because that's exactly what they are. Her subjects are not cut down, put in a vase, nor are the fruit picked and placed on a plate. They are as you see them in nature “Alive”. She tramps through the flower gardens, orchards, and vineyards and garden markets. She is an avid photographer. On the walls of her studio, flowers are blooming and fruit are ripening. A great winter escape to be able to enjoy this warmth and vibrant color. There is nothing grey or dull about a flower and she enjoys painting them in full chroma since they are not too shy to display their extravagant hues. Rena really enjoys painting her original pieces larger than life. The large scale makes us fully feel the impact of the 3 dimensional. Working as an artist with galleries and as an instructor, has been her occupation for many years. Bierman has also participated in art shows as an artist, a curator and a director. Her work has been published with Arabella, Canadian Art, Architecture and Design, Southwest Art Magazine (Collector's Edition) and Xanadu Art Catalogue.